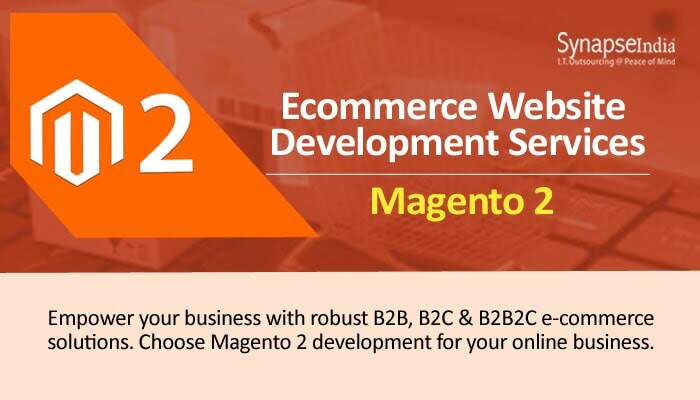 E-commerce website development services offered by SynapseIndia are focused on addressing the confusion and challenges facing businesses while selecting software solutions like Magento 2. The company offers an array of design and development services suitable for e-commerce businesses, including website design, e-commerce app development, and payment gateway integration. Running an online business could be a challenging undertaking if you're not using the right software solution. The success of an e-commerce business largely depends on the use of third-party platforms like BigCommerce, Shopify, and Magento, etc. One can definitely sell products on a custom website, but to get a competitive edge they must leverage a third-party solution. But is has been seen that many businesses face considerable challenges while choosing a suitable e-commerce platform. This is exactly where SynapseIndia comes into play. SynapseIndia has a team of seasoned e-commerce software developers, business analysts and technology experts to help you best use your time and money. They guide you through a set of important factors that play a crucial role in the growth and success of an e-commerce business. Magento 2 is an open-source e-commerce software platform based on the PHP framework, run by the software company Magento Inc. The e-commerce website developers at SynapseIndia employ the platform to create a large number of productive and powerful solutions according to specific needs of clients.